Rear Admiral Piyal De Silva. Pic by Wasitha Patabendige. 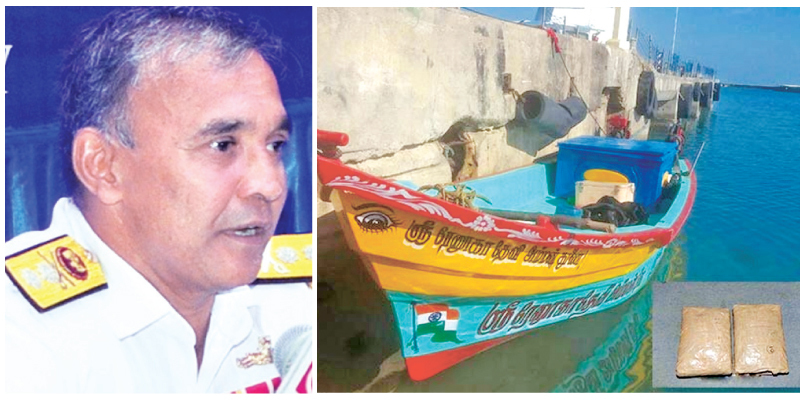 Narcotics worth US$ 1.8 billion had been taken into custody by joint naval forces from January to June this year from the Indian Ocean, Navy Chief of Staff Rear Admiral Piyal De Silva said. Silva said the countries in the Indian Ocean region had jointly conducted the raids to detect narcotics transportation and other illegal acts in the Indian Ocean. He said in the future these raids will be further intensified and talks were underway in this regard. He said that search operations carried out by joint navies have taken 28 tonnes of hashish and two tonnes of heroin during this period while in transit across the Indian Ocean. He said most recently an Australian navy ship had taken into custody 3.6 tonnes of hashish on June 3 and 2.9 tonnes of hashish on June 4 and 40 kilograms of heroin on June 5. Large multi-day fishing trawlers are commonly used for drug transportations and more than 150 such trawlers have been searched during this period. Of them narcotics were found from 13 of them, he said.